2. A changeable rerounding & straightening system to allow for further diameter changes. 3. A fixed location cutting system of hairpin bender The copper tubing cutting system utilizes outer rotating cutter blades to cut the tube. Lubrication takes place. The feed belts reverse and separate the tube ends after cutting. 4. Hairpin Bender Bending system The bending system can move in the length direction to produce hairpin of different lengths. The leg length is set from the PLC and Programming is fully automatic The hairpin bender system is servo driven. This is allows for much better accuracy and less free play or back lash then the older type of hydraulically driven bending heads found in many competitor's units. 5.2 The Hairpin bender will be capable of receiving such special sets of bend tooling as may be dictated by specific bend radius requirements and / or changes in tubing diameter up to 16mm maximum. Please contact us freely if you want any more details for hairpin bender, or Automatic hairpin bender Highest quality with perfect performance hairpin bender will value your production. Looking for ideal Hairpin Bender Manufacturer & supplier ? We have a wide selection at great prices to help you get creative. 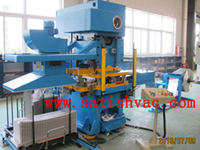 All the Auto Hairpin Bender are quality guaranteed. We are China Origin Factory of Automatic Hairpin Bender. If you have any question, please feel free to contact us.